Next Row - 3ch, 1tr into next tr, * 1ch, miss 1tr, 1tr into next tr, * rpt from * to * to last 2tr and 3ch, 1ch, miss 1tr, 1tr into next tr, 1tr into top of 3ch. Back Opening (continue to shape armhole) - 1ch, ss over 3tr, 3ch, 1tr into next tr, * 1ch, miss 1tr, 1tr into next tr * rpt from * to * 6 more times, 1ch, miss 1tr, 1tr into each of next 2tr, turn leaving 21tr and 3ch un-worked. Pattern Row 1 - 3ch, 1tr into next tr, * 1ch, miss 1tr, 1tr into next tr, * rpt from * to * to last 2tr and 3ch, 1ch, miss 1tr, 1tr into next tr, 1tr into top of 3ch. Turn. Pattern Row 2 - 3ch, 1tr into each tr and 1ch space to end, 1tr into top of 3ch. Turn. Rpt Pattern Rows 1 & 2 twice each until you have 11 rows in all from beginning. Fasten off. Return to remaining stitches at opening, miss first tr, rejoin yarn to next tr with a ss, 3ch, 1tr into next tr, * 1ch, miss 1tr, 1tr into next tr, * rpt from * to * to last 4tr and 3ch, work 1ch, miss 1tr, 1tr into each of next 2tr, turn leaving last tr and 3ch un-worked. Rpt Pattern Rows 1 & 2 three more times each until second side measures same as first side. Fasten off. Next Row - 1ch, ss over first 3tr, make 3ch, 1tr into next tr, * 1ch, miss 1tr, 1tr into next tr, * rpt from * to * to last 4tr and 3ch, work 1ch, miss 1tr, 1tr into each of next 2tr, turn leaving last tr and 3ch un-worked. Shape Neck - (Dec Row) 3ch, 1tr into next tr, * 1ch, miss 1tr, 1tr into next tr, * rpt from * to * three more times, tr2tog over next 2tr (see abbrev). Turn. Next Row - (Dec Row) 3ch, 1tr into next tr, * 1ch, miss 1tr, 1tr into next tr, * rpt from * to * once, 1ch, miss 1tr, tr2tog over next 2tr, 1tr into top of 3ch. Turn. Second side of neck - With RS facing, return to un-worked tr's, miss 11tr, rejoin yarn with a ss to next tr, 3ch, tr2tog over next 2tr, * 1ch, miss 1tr, 1tr into next tr, * rpt from * to * three more times, 1tr into top of 3ch. Turn. Next Row - (Dec Row) 3ch, tr2tog over next 2tr, * 1ch, miss 1tr, 1tr into next tr, * rpt from * to * once, 1ch, miss 1tr, 1tr into next tr, 1tr into top of 3ch. Turn. Next row - 3ch, 1tr into each tr and 1ch space to end, 1tr into top of 3ch. (8tr + 3ch). Fasten off. With WS facing join the side and shoulder seams together by slip stitching or over sewing with a needle and yarn, turn through to RS. Next Row - 3ch, 1tr into each tr to end, ss to top of 3ch on beginning of round. Turn. Rpt last row until there are 14tr rows worked in all or work measures approx 10 Inches from shoulder. Turn. Next Row - Working into back loop of stitch only make 3ch, 1tr into each tr to end, ss to top of 3ch on beginning of row. Turn. Next Row - Working through both loops of stitch make 3ch, 1tr into each tr to end, ss to top of 3ch on beginning of row. Turn. Fasten off. Return to row of loose loops around skirt, join in contrast colour yarn on side edge in top of 3ch, using 4.00mm hook work 1ch, * miss 1tr, 5tr into next, miss 1tr, 1dc into next tr, * rpt from * to * to last 3tr, miss 1tr, 5tr into next tr, miss 1tr, ss to first dc on beginning of row. Fasten off. Next Row - 3ch, 1tr into next tr, * 1ch, miss 1tr, 1tr into next tr, * rpt from * to * to last tr, make 1ch, miss last tr, ss to top of 3ch. Turn. Next Row - (Dec Row) 1ch, ss into base of 1ch, ss over next 3tr, 3ch, 1tr into next tr, * 1ch, miss 1tr, 1tr into next tr, * rpt from * to * to last 3tr and 3ch, 1tr into next tr, turn leaving last 2tr and 3ch un-worked. Next Row - (Dec Row) 1ch, ss into base of 1ch, ss over next 2st's, make 3ch, 1tr into each tr and 1ch space to last 1ch space, 1tr and 3ch, 1tr into 1ch space, turn leaving 1tr and 3ch un-worked. Next Row - (Dec Row) 1ch, ss into base of 1ch, ss over next 2tr, make 3ch, 1tr into next tr, * 1ch, miss 1tr, 1tr into next tr, * rpt from * to * to last 2tr and 3ch, 1tr into next tr, turn leaving 1tr and 3ch un-worked. Next Row - 1ch, 1dc into base of 1ch, 1dc into each dc to end, ss to first dc. Rpt last row three more times. Fasten off. Edge Back Opening - Using 3.50mm hook and with RS facing, join contrast colour yarn to base of back opening, work 2dc into each of the next 7 row ends, 1dc into last row end (15dc), 3dc into corner, work 1dc into each of next 7tr along top of back, 8dc evenly down first side of neck, 1dc into each of the next 11tr across front, 8dc evenly up second side of neck, 1dc into each of the next 7tr along top of back to corner, 3dc into corner, work 1dc into next row end, 2dc into each of the next 7 row ends (15dc). Turn. buttons to correspond with buttonholes, thread chain tie through alternate tr’s under bodice and tie in a bow. 7th Row - 3ch, 1tr into next tr, * 1ch, miss 1tr, 1tr into next tr, * rpt from * to * to last 3tr, 1tr into next tr, turn leaving last 2tr un-worked. Rpt Pattern Rows 1 & 2 from bodice twice, until there are 12 rows in all from beginning. Turn. Next Row - Work through both loops, 1ch, 1dc into base of 1ch, 1dc into each dc to end. Turn. Starting with 1ch, work two more rows in dc. Turn. Front & Neck Edging - 1ch, 2dc into base of 1ch, 1dc into each dc to last dc, 3dc into last dc, working along neck edge, work 15dc evenly into row ends, 1dc into each of next 2tr, work 15dc evenly into row ends, 1dc into base of 1ch, ss to first dc. Turn. Next Row - 1ch, 2dc into base of 1ch, 1dc into each dc along neck edge and around front of bonnet, working 3dc into corners, ss to first dc. Fasten off. Front Trim - With front of bonnet towards you and working into row of loose loops, rejoin contrast colour to first loop, 1ch, work 1dc into base of 1ch, * miss 1 loop, 5tr into next loop, miss 1 loop, 1dc into next loop, * rpt from * to * to last 3 loops, miss 1 loop, 5tr into next loop, 1dc into last loop. Fasten off. Chain Tie - Using contrast colour yarn and 3.50mm hook make 141ch, ss into 2nd ch from hook, ss into each ch to end. Fasten off. Finishing - Sew in and tie off loose ends of yarn. Thread chain tie through alternate tr’s along neck edge of bonnet and tie in a bow. 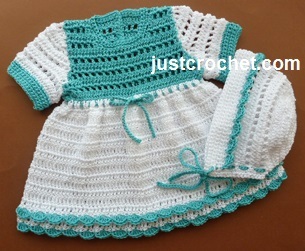 Hope you enjoy this free baby crochet pattern for a cotton dress and bonnet.